FREE patterns are available below. Look for the PDF symbol below the item and download. ​**COPYRIGHT KINDNESS - The patterns below are for personal use by you. Please do NOT copy or distribute without written permission by Jody. My BFF Gayle is a quilter and wanted to do a 'buddy' project that consisted both her love of quilting and my passion of crochet. 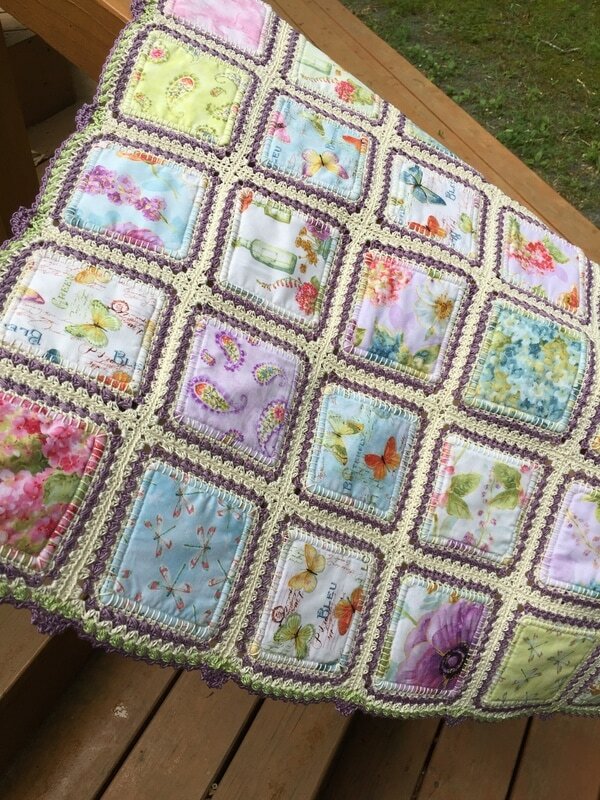 She found a wonderful design by Tiffany of Fannylou Designs - the 'High Tea Quilt' was a fun and wonderful experience. I've never quilted before so this was a great easy introduction to a basic quilting for me. After the winding through a maze of hundreds of fabrics I finally found a charm pack that was truly charming (lol). I also decided that a wall hanging would be enough of a challenge for me to start. After a I finally got all of my squares sewn and the blanket stitching done - I was ready to crochet the edges. Because I'm using the quilt as a wall hanging I decided to use thread for the crochet borders instead of yarn. It provided a smooth glossy finish and a neater designed edge. I chose Aunt Lydia's #3 thread because it is a heavy enough gauge to frame the work and show off the stitch design I had in mind. The finished product surpassed my expectations - I loved how it turned out. 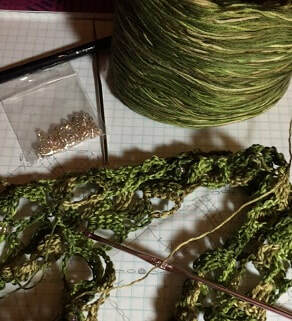 3-15-19 - The Puff Border Stitch is available for download on my Ravelry page - click the link below to hop over! This pattern came to me recently on a 'snow weekend'. A chance to work up something quick and de-stash. ​It took about 3 hours all together to work this up. I used 2 brands of yarn but both were 'Bulky' #6 weight. You can work it up shorter or longer depending on how many times you want to wrap it. 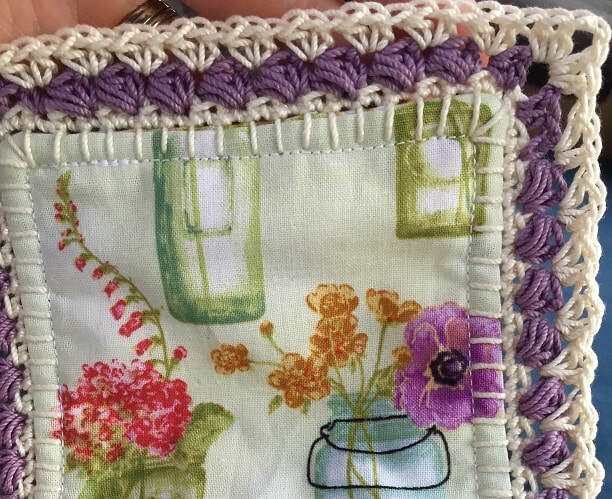 The stitch count works in even numbers - for each 2 stitches you add (or subtract) 2.5" of finished work. This is a 1st attempt at this little accessory. I hope to have a couple more versions available before too long. This is one for free! Try it different colors - with or without fringe. 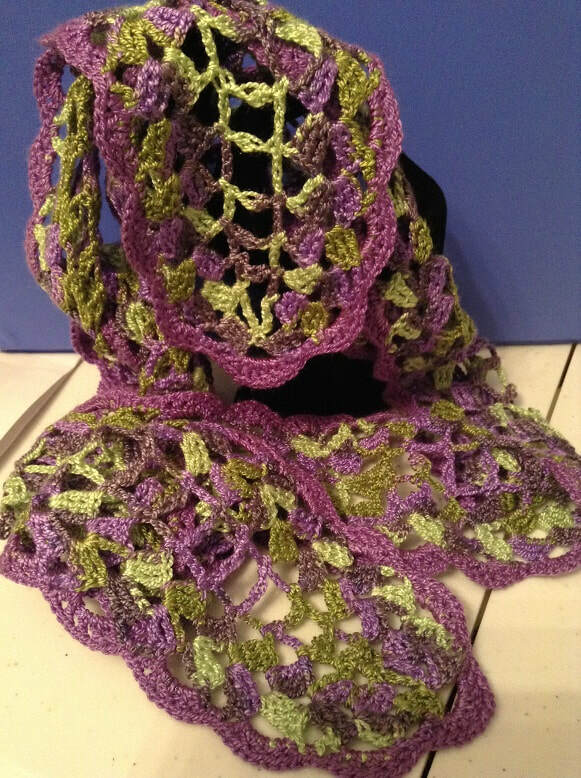 This beautiful broomstick lace scarf is a wonderful weekend project. 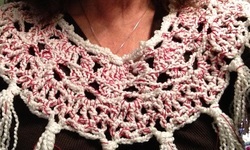 The pattern is worked so that the lace rows lay flat and the scarf looks great on either side. 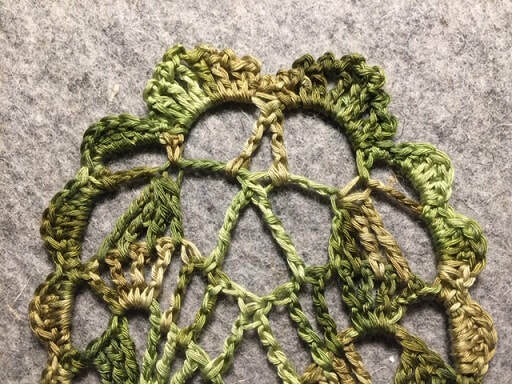 One of my first broomstick lace designs. Pattern available in my Ravelry store, click link below to hop over. This little number was inspired by a fabulous thread and a wonderful respite at the beach. Chilly breezy days filled with sounds of ocean waves rolling onto the beach, seagulls singing, rocking chairs and warm tea. I loved the stitch repeat and how wonderfully silky it felt. The drape was fantastic and it felt light and airy. 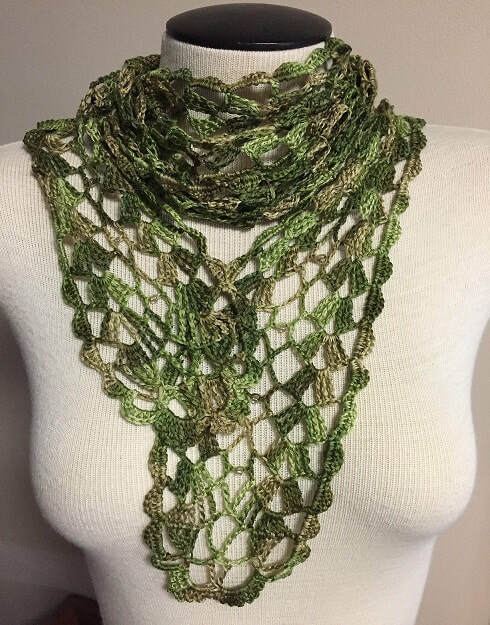 It's now available in my Ravelry store. Click the link below to hop over. Here a chick - There a chick - Everywhere a chick-chick! 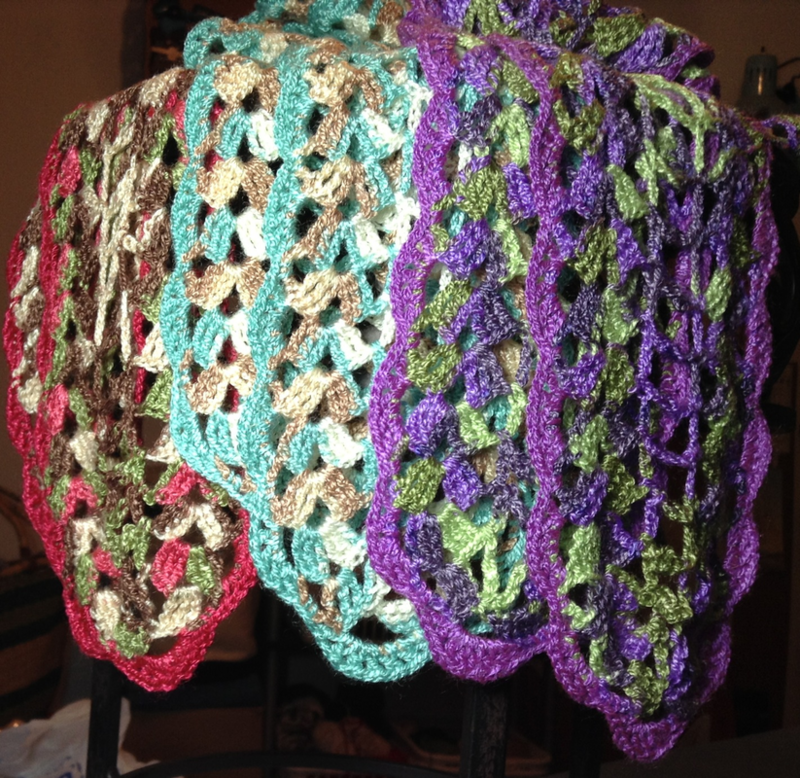 These are an adapted version from a very old pattern from the early 70's. 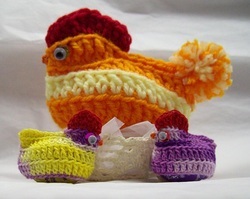 Great little accessory for Easter baskets & gifts; or for your springtime kitchen centerpiece. Plastic eggs are used to plump up the chick. Small chicks can seat over foil wrapped candies. I've made this a couple of times - and have reviewed the written pattern. More beads can be added if you prefer more pop. This pattern is also available through my Ravelry site.